Hobie Kayak Shipping info via New Penn or YRC. Hobie shipping available to your home, business or terminal. 2019 Hobie Pricing now in effect.... Visit our HOBIE Showroom to see the NEW models, NEW seats and NEW features. Note; We do have a handful of previous year Hobie kayak or Eclipse models in stock at a lower than 2019 price. Stop into our showroom to see the NEW Hobie line. amazing propulsion of the Mirage Drive combined with the effortless steering of the Twist-n-Stow Rudder, comfortable seating and outstanding stability." These are just a few of the Hobie models we stock. 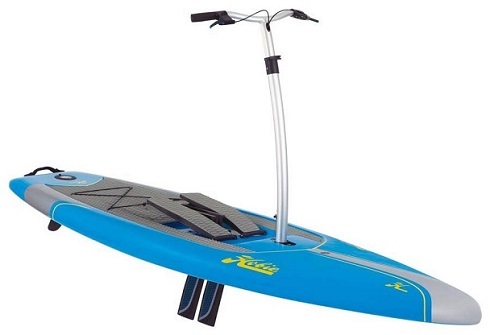 The world leader in SUP is now available at Oak Orchard. featuring their top selling "Eclipse" with Mirage pedal drive ! STABILITY Wind, waves, and wake? No problem. The Eclipse has width, hull design, and handlebars to provide an extra-stable ride superior to any standard paddleboard. CONTROL Steering is at your fingertips, utilizing hand-levers like those found on a bicycle. Squeeze right, go right. Squeeze left, go left. The durable rudder offers pinpoint maneuverability unique to the Mirage Eclipse. 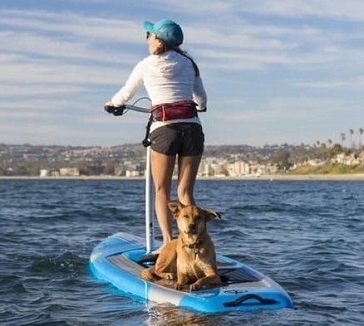 VERSATILE The aluminum alloy handlebar and Mirage Drive are easily removable in seconds; just lock the rudder in to place as a tracking skeg and paddle your Eclipse like a traditional stand up paddleboard. 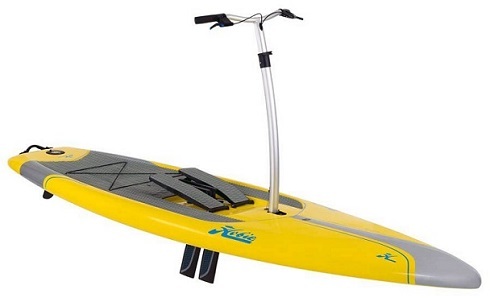 This is a Board you can Pedal OR Paddle! ENJOY Like to stand and fish? How about photography? 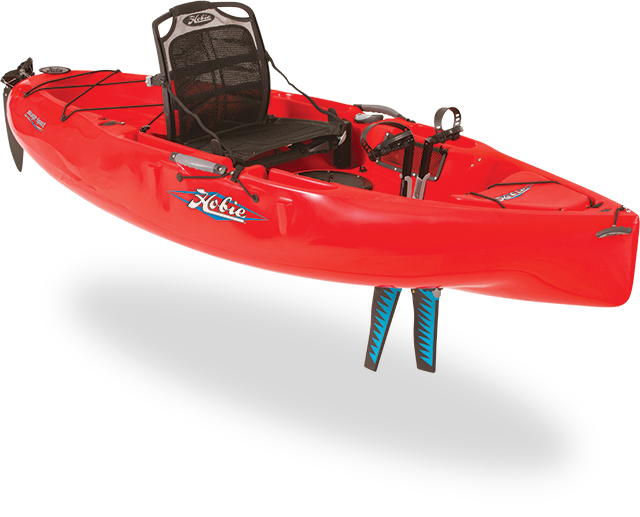 Just add a Hobie H-Crate, fishing rod holders plus a plenitude of gear management options for your new Eclipse. Eclipse 10 10' 6" 33.5" 225 lbs. 43 lbs. 54 lbs. Eclipse 12 12' 35" 275 lbs. 48 lbs. 59 lbs. Diverse groups and agendas demand diverse options, and the versatile Hobie Sport plays to all audiences. The key is its movable seat, which can be placed fore or aft to accommodate kayakers of all heights and ability levels. Hobie's MirageDrive® system is standard, and the boat's stable design facilitates a variety of activities, from a leisurely afternoon pedal to a relaxing evening of catching zephyrs using the optional Sail Package. Whether it's work or play, the Outback boasts the functionality, stability and utility to get the job done. A wide hull provides form stability, allowing you to cast - or reel in the big one - without rocking the boat. The Outback features plenty of cargo and stowage space, and, thanks to its MirageDrive® system, your hands are free to tend to your photography, casting, or whatever else is on the day's "work list". Whether it's a day of casting, paddling, pedaling or sailing, Hobie's brand-new Revolution 11 has you covered. 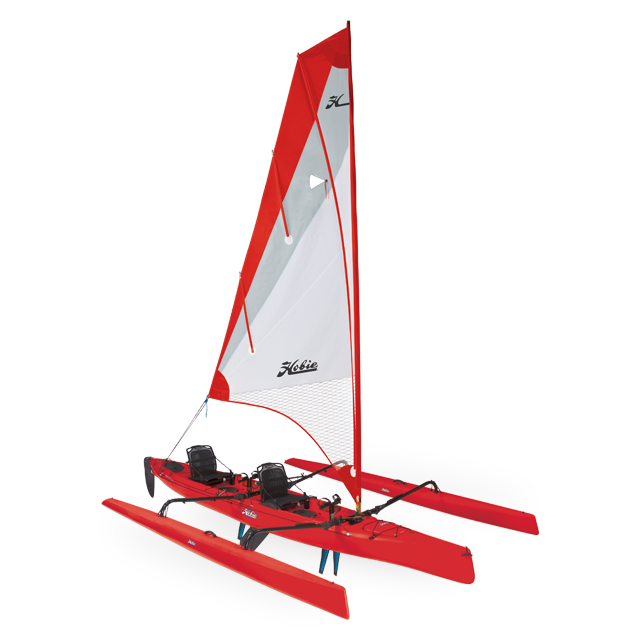 The "Revolution 11 features a slippery-yet-stable hull form, Hobie's innovative MirageDrive system, generous stowage and lashing configurations and an optional sailing kit, giving you the ability to go. The Revolution 11's featherweight hull accelerates now and her nimble-minded design and impressive turning radius allows you to adroitly stalk fish and confidently negotiate persnickety shoals or currents. Ideal for small-to-midsize users. Kayaking form and function intertwine with the Revolution 13. 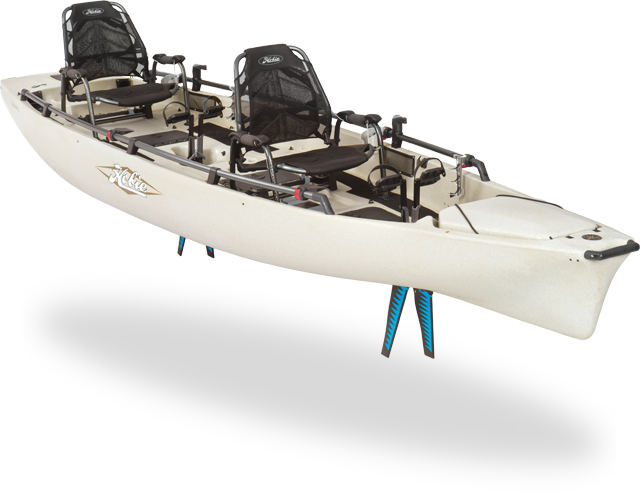 Whether you're seeking a nimble kayak, a floating SUV, or an all-out dragster for settling friendly dockside wagers, the Revolution 13 is ready. Featuring a lightweight, low-drag hull shape, the Revolution 13 accelerates quickly and maintains speed with minimal effort; abovedeck, it's designed for maximum hauling capacity. Three enclosed stowage spots (bow, midships and stern) and a generous stern cargo area facilitate everything from an evening paddle to a multi-day excursion. Set your course with the new Mirage Compass, the newest addition to Hobie�s fleet of award-winning pedal kayaks. Simplicity defined, its time-tested MirageDrive pedal system with Glide Technology moves you easily through the water. Outfitted with a breathable mesh seat, the Compass offers maximum stability and an oversized cockpit and flat deck for standing. 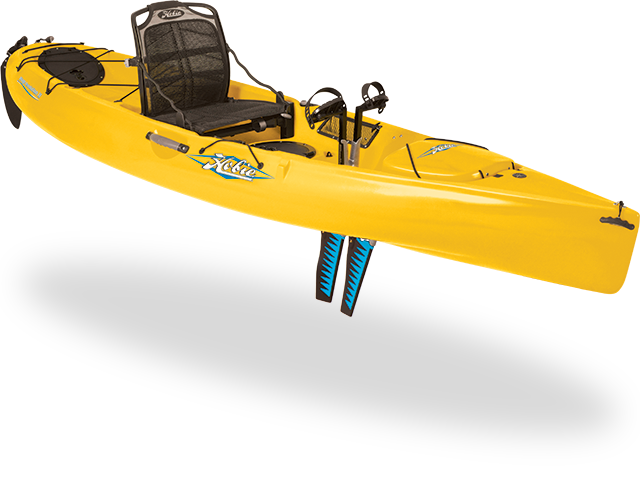 A sharp turning radius makes this fishing kayak nimble in tight quarters, yet able to speed over open water in stealthy fashion. H-Track accessory mounts and a transducer cavity ready for you to install a Lowrance� fishfinder. • Compass Seat is adjustable, removable, breathable and comfortable! • Two H-Track accessory mounts provide customization without drilling holes. Smooth, stable and built for two, the Outfitter is designed around a philosophy of utility, performance and ease-of-use. Onboard, little features such as molded utility trays, built-in drink holders, dual helm controls, or conveniently positioned rod holders make the Outfitter a pleasure to use, regardless of the destination. Whether it's a solo after-work session or a long weekend of float casting with a friend, the Outfitter boasts a wide, stable hull platform, dual MirageDrives® and ample stowage space to keep you well provisioned and properly organized. Fully Rigged Weight: 117 lbs. Long, narrow and lightweight. 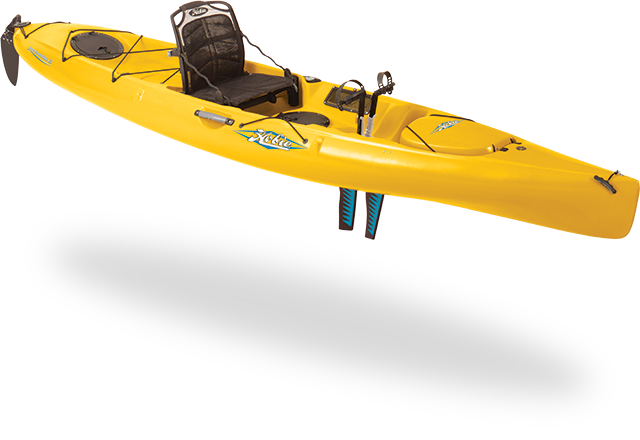 These design elements define the completely redesigned Oasis® and give this kayak surprising performance-minded qualities, such as quick acceleration and an impressive hull speed, without sacrificing utility or hauling capacity. The new Oasis features three enclosed stowage areas and one large on-deck cargo area, dual steering controls, a roomy cockpit with dual MirageDrives, and the ability to go anywhere, anytime. Whether you're alone or with a companion, you'll be amazed at how well the Oasis performs. The new Pro Angler 12 is the most versatile fishing boat we've ever designed. 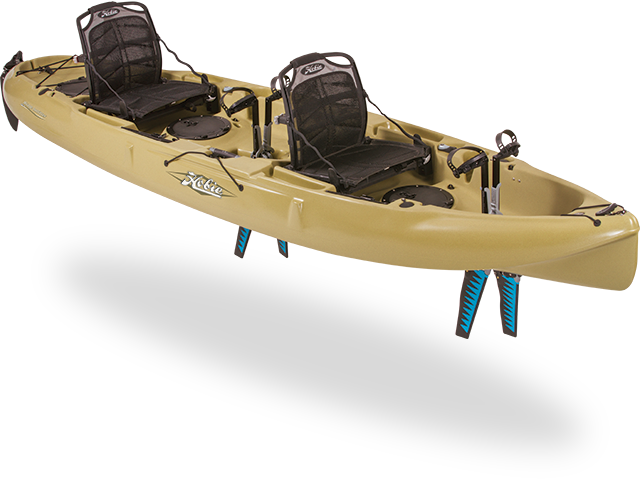 This 12-foot boat sports a 500-pound weight capacity and is packed full of "must have" features that kayak anglers demand. From lakes to rivers to open ocean, this boat has no boundaries - stand and fish with incredible stability, securely store six rods (four horizontally, two vertically), and access your tackle with ease. Integrated dual-steering controls for left or right-handed accessibility while under way. Vantage seating provides ultimate comfort and adjustability in a lightweight, easily removable design. Vantage® seat system is 4-way adjustable. The "Lowrance Ready" installation system makes adding a fishfinder a breeze. Powered by our patented MirageDrive® with Turbo Fins, the Mirage Pro Angler 12 has got the giddy-up! 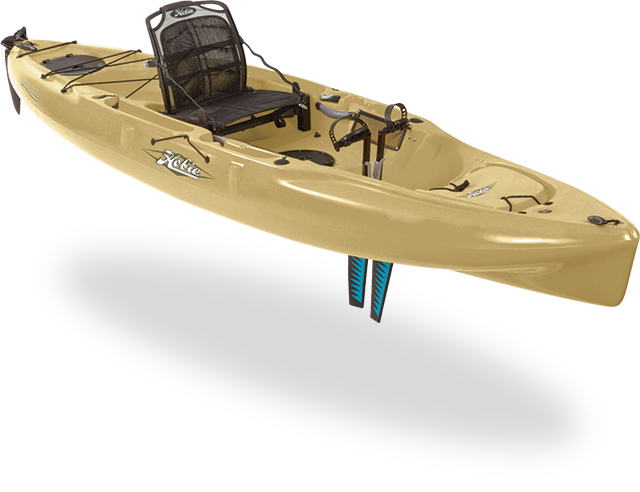 Looking for an affordable, durable, lightweight, ultra-stable, "built-for-anglers" personal watercraft? • Fully Rigged Weight: 129.5 lbs. 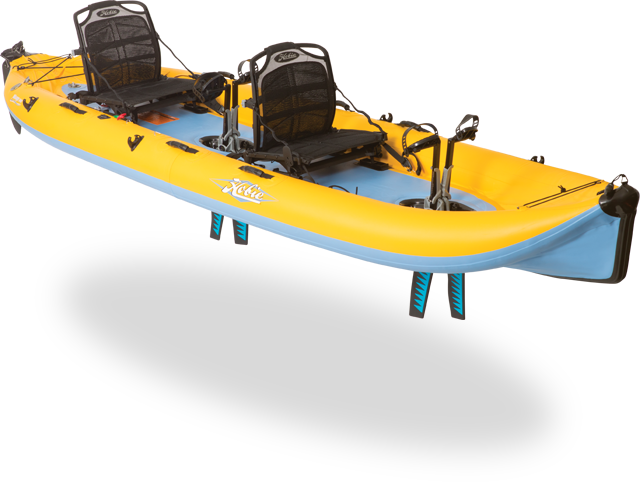 Introducing the new Hobie Mirage Pro Angler 14. One of the world's most fishable, feature-filled boats on the market today. A revolutionary design breakthrough with extraordinary stability. It has everything you need to maximize your angling experience without sacrificing comfort, functionality or storage capabilities. The Pro Angler 14 comes loaded with features that put it in a class by itself. With a capacity of over 600 lbs., you can bring it all. Protected horizontal storage for up to six rods and two additional vertical rod holders. Space for 13 Plano® tackle boxes, three in-hull storage compartments, plus an additional large on-deck storage area for an optional livewell or cooler. 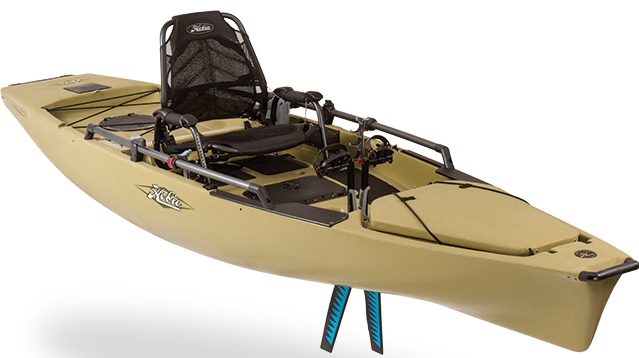 You get a fully-adjustable, breathable Cool Ride seat, a work area/cutting board and replaceable mounting boards on each side to attach your fish finder, GPS, lights, or downriggers. The Pro Angler is powered by the Hobie MirageDrive, which allows you to enjoy fishing without the noise and expense of a gas engine. • Length: 13' 8 "
• Hull Weight: 120.5 lbs. • Fully Rigged Weight: 145.5 lbs. 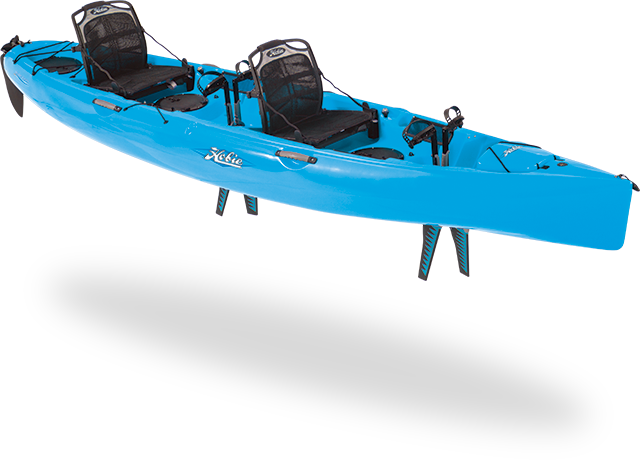 Introducing the new Hobie Mirage Pro Angler 17T. One of the world's most fishable, feature-filled boats on the market today. A revolutionary design breakthrough with extraordinary stability. It has everything you need to maximize your angling experience without sacrificing comfort, functionality or storage capabilities. The Pro Angler 17T comes loaded with features that put it in a class by itself. With a capacity of over 900 lbs., you can bring it all. Protected horizontal storage for up to ten rods and molded-in vertical rod storage. Space for 13 Plano® tackle boxes, three in-hull storage compartments, plus an additional large on-deck storage area for an optional livewell or cooler. 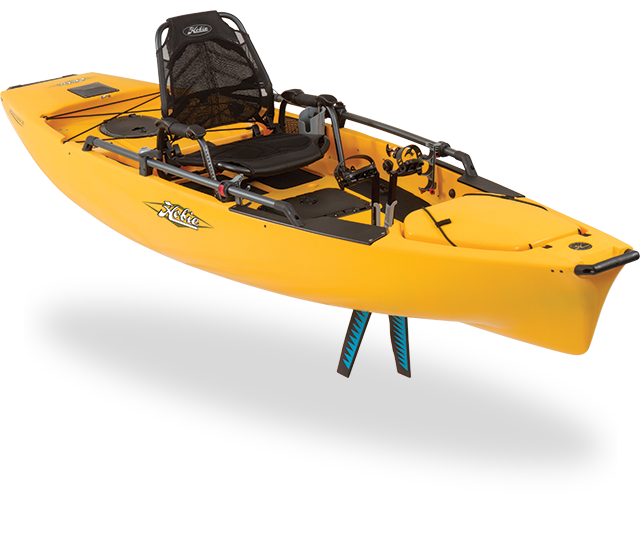 You get a fully-adjustable, breathable Cool Ride seat, a work area/cutting board and replaceable mounting boards on each side to attach your fish finder, GPS, lights, or downriggers. The Pro Angler is powered by the Hobie MirageDrive, which allows you to enjoy fishing without the noise and expense of a gas engine. • Hull Weight: 206.5 lbs. • Fully Rigged Weight: 244 lbs. 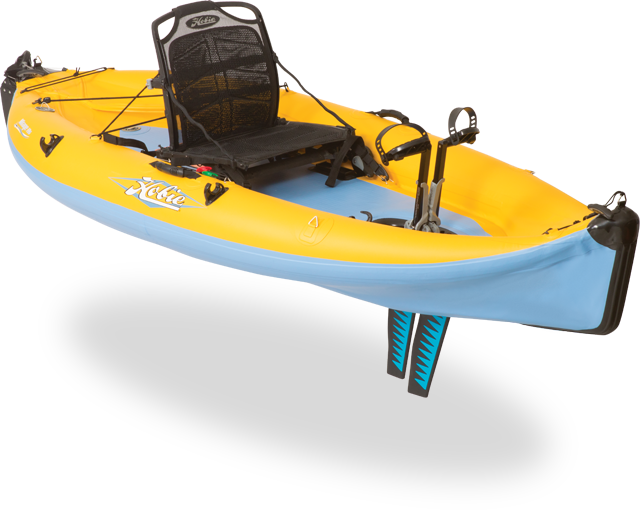 Presenting the all new i-Series, combining the Hobie MirageDrive within an innovative hull, its patent pending design will redefine how the world views inflatable kayaks. This 9 foot single is perfect for those who are short on room and storage. It packs nicely within its own rolling travel bag, so it can fit in the trunk of your car, on your boat, in your RV - you can even take it on the plane for your next vacation. Optional accessories include; a Sail Package, Cup Holder, Rod/Accessory Holder and Plug-in Cart. Fitted Hull Weight: 41 lbs. Fully Rigged Weight: 70 lbs. Mirage Drive Weight: 6.6 lbs. Fitted Hull Weight: 67.1 lbs. Fully Rigged Weight: 111.4 lbs. 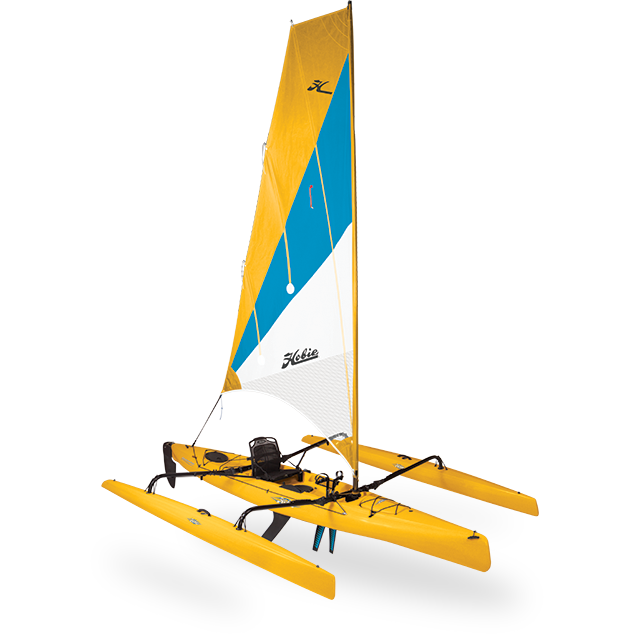 A boomless, roller-furling sail rig similar to the rig on the Hobie Bravo with plenty of sail area for excellent performance, completely manageable from the cockpit with the pull of a line. Two retractable amas that fold up against the side of the boat, again with the simple pull of a line, for easy docking, maneuverability, and transport. 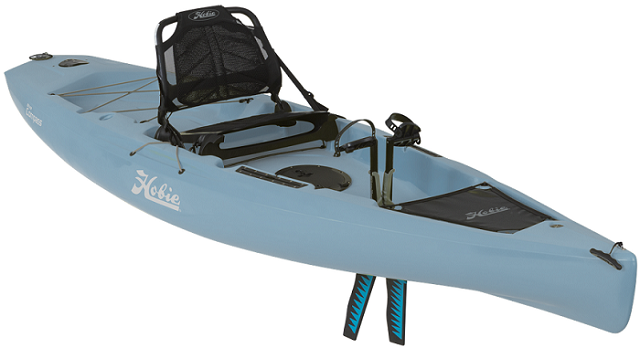 The cockpit is the stable platform of the Hobie Mirage Adventure Kayak, offering full versatility as a pedaling kayak when conditions are not convenient for sailing. Width (Amas Extended): 9' 6"
Sail Area: 65 sq. ft.
Sail Area: 90 sq. ft.
Twice the fun! 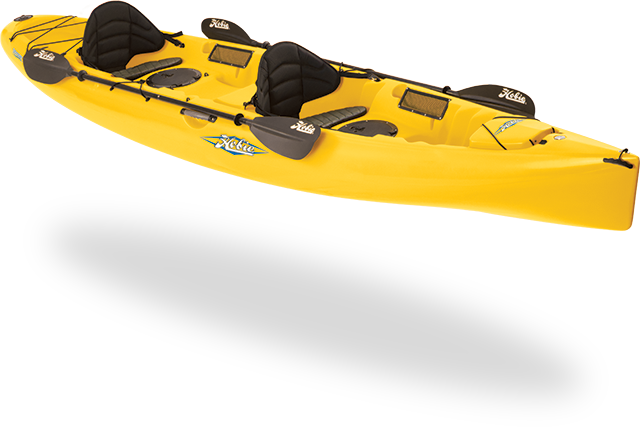 The Kona tandem kayak is the perfect way to share the Hobie experience. The Kona's all new design (patent pending) incorporates a shorter waterline with a wide, stable template. The result is a nimble double that's a snap to paddle, but still features plenty of cargo room, twin cup holders, on-hull paddle storage and two mesh-covered stowage spaces for all your gear. The ideal for couples or the family. • Hull Weight: 68 lbs. • Fully Rigged Weight: 78 lbs. 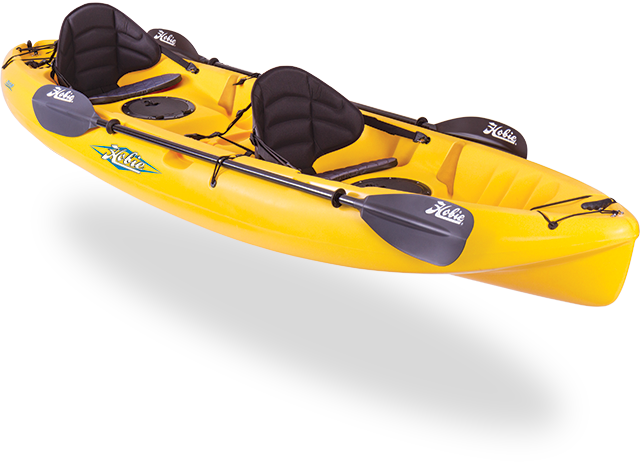 The Hobie Odyssey is the perfect family oriented, go-anywhere, do-anything paddle kayak. Featuring a long, sleek waterline, a stable hull, great tracking and the ability to haul 540 pounds - plus plenty of ondeck gear storage - the Odyssey opens up worlds of fun. While this fully redesigned hull accommodates two, it can be paddled by one using the molded-in center-seat position. Or, this center-seat area can be used to tote along a junior crew member, extra gear or even the family hound. • Hull Weight: 81.5 lbs. • Fully Rigged Weight: 91.5 lbs.